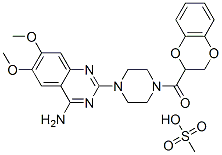 Doxazosin Mesylate is an α-blocker drug related to prazosin, specifically acting as an AR (α-1-adrenoceptor) antagonist. Doxazosin Mesylate inhibits the binding of norepinephrine to the α-1 receptors on the membrane of vascular smooth muscle cells. The primary effect of this inhibition is relaxed vascular smooth muscle tone (vasodilation), which decreases peripheral vascular resistance, leading to decreased blood pressure.